While there is no question that a vegan diet is healthy, finding unique and flavorful recipes can sometimes prove to be a challenge. 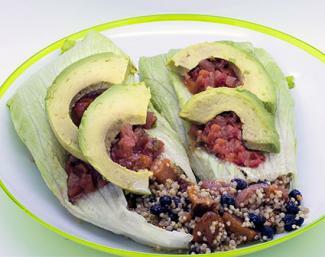 These vegan lettuce wraps are not only packed with flavor, but contain a variety of nutrient-dense grains and vegetables guaranteed to keep your body working at its prime. Turn up the heat with these flavorful tofu lettuce wraps! Serves 4 to 6. Add onions, ginger, and garlic to pan and cook for 8 to 10 minutes, or until onions are soft and starting to brown. Add tofu and water chestnuts to pan, and cook for 4 to 6 minutes, or until heated through. Add soy sauce, hoisin sauce, and hot sauce to pan, cook for 1 to 2 minutes, or until heated through. Place 2 to 3 tablespoons of tofu filling into each lettuce leaf. 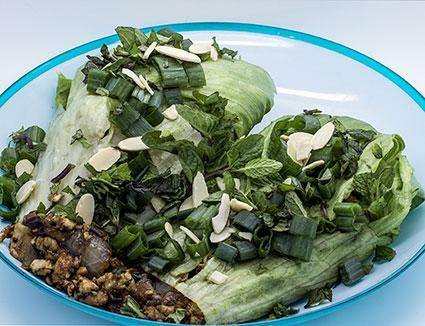 Top lettuce wraps with green onions, mint, and slivered almonds, if desired. 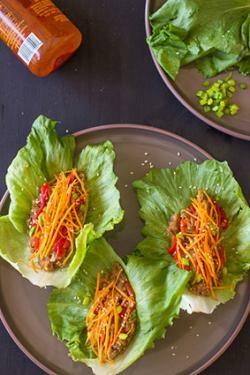 A must-have for quinoa lovers, these filling lettuce wrap​s are hearty enough for t​he carnivores in your family. Serves 4 to 6. Place sweet potatoes on a cookie sheet, drizzle with olive oil, and sprinkle with cumin, cinnamon, and sea salt. Bake sweet potatoes for 20 to 25 minutes, or until golden brown. Place quinoa in a small saucepan, and add 1 1/2-cups of water. Bring water to a boil over medium-high heat, and cook quinoa for 15 minutes, or until water is fully absorbed and quinoa is tender. Reduce heat to low, and stir in black beans. Add sweet potatoes to quinoa and black bean mixture. Place 2 to 3 tablespoons of quinoa mixture into each lettuce leaf. Top with a slice of avocado and hot sauce, salsa, and jalapeno slices, if desired. These lettuce wraps are great served with a side of steamed white rice. Serves 4 to 6. ​​Soak walnuts in hot water for 10 minutes, then drain. Place walnuts, ginger powder, olive oil, and garlic in food processor, and pulse 8 to 10 times until walnuts are coarsely chopped and ingredients are well combined. ​Add sriracha sauce, maple syrup, and 1 teaspoon sesame seeds to food processor, and pulse 2 to 3 more times to incorporate remaining ingredients. Place 2 to 3 tablespoons of walnut mixture into each lettuce leaf. Top with carrots, red bell peppers, green onions, and sesame seeds, if desired. For a tasty, weekend meal, consider these vegan lett​uce wraps. Your taste buds - and your waist​line - will thank you!